are smart, easy, do-it-yourself, and goodlooking. RiTUAL. A ceremonial act ~ Rites used in the course of worship ~ The performance of ceremonial acts ~ The prescribed form of conducting the ceremony ~ A method of procedure that is followed without variation ~ performance with gestures, words, and objects, often in a sequestered place. Claire Marcus holds an MFA in painting and a BA in architecture from the University of Pennsylvania, where she studied with painters Rackstraw Downes and Neil Welliver and photographer Rudy Burckhardt. She develops paintings, drawings, and photographs made on site into mixed media pieces, working in series from one image or medium to the next. Her current works address natural and built structures in New York City, Philadelphia, and other urban environments. Claire’s work has been shown and published in national and international venues including Asheville BookWorks, the Center for Book Arts at MoMA/PS1, Kalopsia Collective Edinburgh, Philadelphia’s Art in City Hall, Philadelphia Center for the Book, Philalalia at the Tyler School of Art, The Sketchbook Project Tour, and numerous commercial galleries. 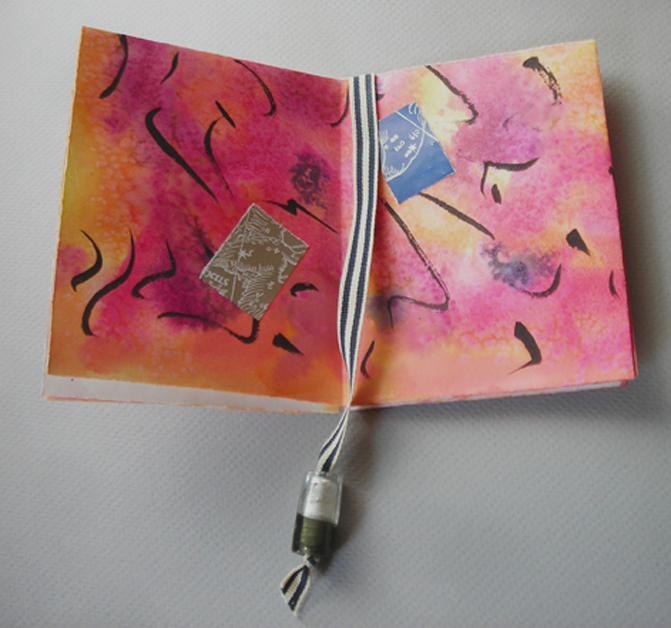 Single sheet book: watercolor salt-resist with ink drawing, collaged with found astronomy maps, ribbon marker with glass bead. Heavybubble is a web service designed for career artists. Publish a do-it-yourself portfolio website and start spreading the word. Upload your artwork, and make changes whenever you want. We love art and the people who make it.